There are a lot of reasons Metromile stands out in a sea of car insurance options, but perhaps the biggest differentiator is its billing model, which is based on a totally sensible premise that others in the insurance game simply haven’t caught on to: the less you drive, the less you pay. It seems like a no-brainer, but most car insurance companies require customers to pay a flat monthly fee, regardless of whether they’re commuting two hours daily or keeping their weekend vehicle locked in the garage Monday through Friday. With its innovative billing system, Metromile customers actually have control over how much they spend every month, meaning they can tailor their bill to fit their budget and lifestyle. No more wasting cash on a (necessary) service you hardly ever have time to use. When you first make the switch to Metromile (welcome! ), you’ll be charged for your first month’s base rate. That’s it—and in most cases, it’s much lower than you’d expect. 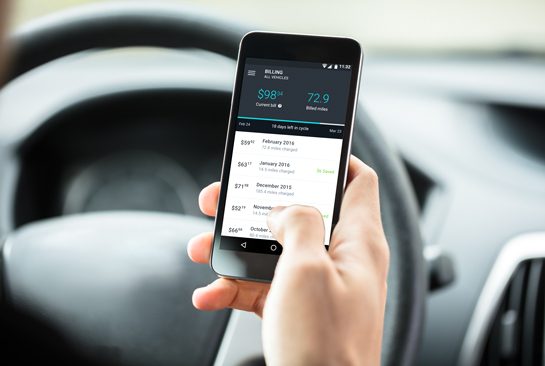 Just like other insurance companies, Metromile considers a variety of factors when calculating a base rate—things like the driver age, credit history, type of vehicle, driver history, and more. At the end of the month, you’ll be charged for the next month’s base rate, plus any miles you drove the previous month, at your per-mile rate. Your pay-per-mile rate is unique to you too, based on those same factors mentioned above. It’s that simple. Plus, when you first sign up for Metromile, you’ll be enrolled in automatic billing, so you never have to worry about missing payments (New Jersey customers have the option of opting out of this system in favor of manual billing or payment by check). Need to update your billing information? No problem. All you have to do is log on to your online dashboard and follow the easy instructions (this is also where you’ll find your billing statements and a lot of other important info). 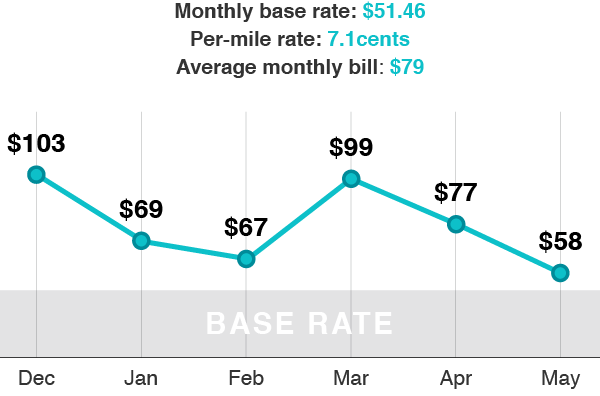 You might notice that your rate varies a bit month to month. There are a few good reasons for that. First, it’s important to understand that because your base rate is determined by a daily rate multiplied by the amount of days in each month, shorter months will always cost less (so if there are 31 days in the month versus 30, the base rate will be slightly higher). But your actual daily rate won’t change within a 6-month period unless you make a specific request. While your base rate will pretty much stay the same (give or take the difference of a few days depending on the length of the month), the other portion of your bill may fluctuate quite a bit—that’s the pay-per-mile portion. Because Metromile doesn’t believe in charging customers for miles they don’t drive (because, well, that’s just not cool), customers are in complete control and have the opportunity to budget their miles accordingly. Your miles are charged retroactively, so you’ll have the opportunity to reflect on your actions and, if necessary, make adjustments. Took a few unnecessarily long joyrides last month? If money’s tight this month, you may choose to ride your bike around town instead and save some dough. Your sixth bill won’t receive a credit, and from there on out, your bill will only ever be calculated from your base rate + per-mile rate x miles driven that month. 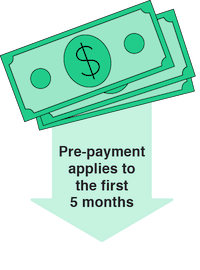 This prepayment is only required for first-time policyholders, but you may be pleasantly surprised each time you receive one of those first five bills and remember you already partially paid them (your future self will thank you!). Flexibility is great, and Metromile gets that (hence that modifiable billing model). But some things are better set in stone—like your billing date. Your billing cycle begins on your policy effective date. That numerical date on the calendar continues to be your billing date for every remaining month of your Metromile policy (so if your policy starts on the 22nd of May, your billing date will be the 22nd of June, July, August, etc.). Each billing cycle spans a four-week time period and ends on the day before your monthly effective date (so in the above scenario, it would start on the 22nd and end on the 21st of the following month). Your monthly bill will be due two days following your monthly effective date (or four days if you’re in New Jersey). While you can’t change your billing date, you can absolutely alter your billing method. If you need to change your credit card information, just log into the online dashboard and head to the billing section. If for any reason Metromile doesn’t receive your payment by the due date, you’ll be notified via email, and Metromile will continue to try and charge the card on file. If the card continues to be denied after two failures in a row, Metromile will stop attempting to charge it and instead send you another email with a potential cancellation date for your policy unless payment is received. The good news? No late fees! So just make sure your card info is all up to date, and you won’t run into any problems. What If I Don’t Drive At All One Month? If your main mode of transportation is anything but your car, you might be wondering how billing works during a month of no driving. The answer is simple: it’s the exact same system! You’ll still get a bill for your low monthly base rate and pennies per any miles you did drive. If your car is just parked the whole month, you only pay the base rate. Whether you’re stationary or constantly on the go, you’ll be covered with Metromile. And don’t worry if you take a long road trip—you won’t receive an astronomically high bill. Your daily mileage charges are capped at 250 miles per day for each vehicle (150 miles per day in New Jersey), so you won’t be charged for any miles above those amounts in any calendar day. So whether you’re always behind the wheel or you avoid the driver’s seat whenever possible Metromile makes sure your bill always fits your lifestyle. One great way to get more answers to common questions is to visit the Metromile Help Center. There, you’ll be able to comb through content on a variety of topics like billing, pricing, coverage, and more. If you’ve got a question, chances are someone else has it, has had it, or will have it in the future. If you’re still relying on another traditional form of car insurance, visit metromile.com today to get a free quote. And if you’re a current customer looking for a plan that’s more suitable for your needs, head to the website and see what other options are available—you won’t be disappointed.